How Can I Restore Lost Data from Samsung Galaxy? How to Recover Deleted Music from Samsung Galaxy? How to Recover Deleted Contacts from Samsung SIM Card? How to Recover Deleted SMS from Samsung SIM Card? How to Recover Lost Data from Samsung SIM Card? How to Recover Deleted Data from Samsung Tablet? "Yesterday, I flashed my Samsung Galaxy S8, but I forgot to backup text messages to computer. Now all messages on my Samsung phone have been deleted. Can you help me recover them?" No matter you lose messages because of improper operations or formatted device, you are able to recover deleted text messages from Samsung smart phone by using recovery software. While, the most important thing you should keep in mind that if you mistakenly touch the "Delete" button and lose your messages, you should stop adding or editing phone data after deletion happens. Then you should turn to recovery program as soon as possible before new data overwrite your deleted messages on your phone. Otherwise, you are likely to lose text messages forever. While, how can we get the right program to restore lost SMS from Samsung Galaxy S9/S8/S7/S6/S5? 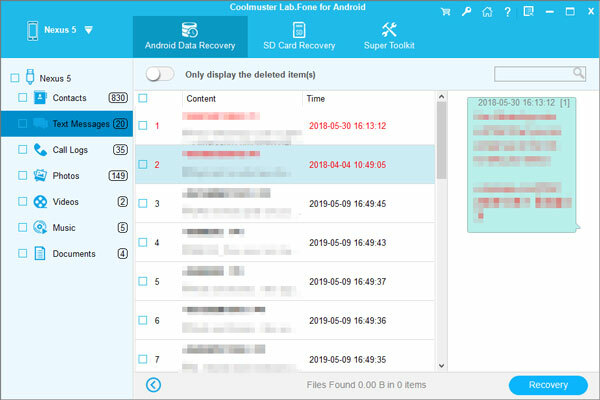 In this page, I'd like to share you with this Coolmuster Samsung Messages Recovery, which is absolutely the most effective tool to help users retrieve lost Samsung messages. As this software enables you to preview your lost text message conversations before restoring, you can pick out your wanted messages and recover them selectively. By the way, this Samsung Messages Recovery program will display all existing and deleted messages on your Samsung mobile phone after scanning your device. Thus, you are able to restore all messages to computer as a backup in case of losing them twice. Now you can click here to get the free trial version. To begin with, download and install this software on your computer. Then open it and connect your Samsung Galaxy S9+/S9/S8+S8/S7/S6/S5/Note 8/Note 7 phone to PC via USB. In order to get your phone detected by this software, you should root your Android phone first. If this software asks for ROOT permission to your phone, please choose "Allow". Then it will automatically scan your phone data. In this step, you are able to preview all contacts and messages on the menu. Now please click "Message" to view the whole text message conversations. Then you can freely mark your needed messages. At last, press the "Recovery" option, you can achieve to recover deleted text messages from Samsung smart phone in a batch within seconds. In the same way, you are able to restore lost contacts from Samsung phone without any difficulty. 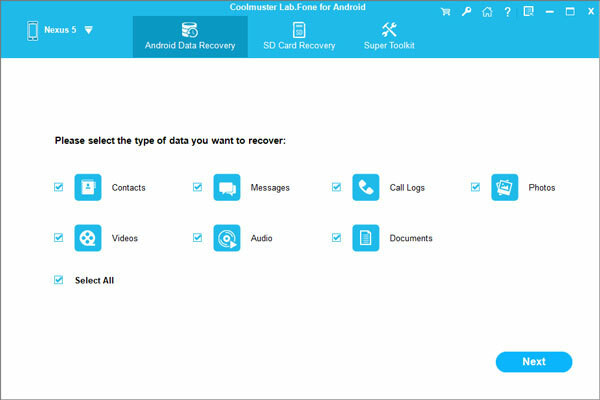 What's more, this Coolmuster Samsung Messages Recovery can be compatible with all Android mobile phones, including Motorola, HTC, LG, Sony, HUAWEI, ZTE, and so on. It is indeed practical, just have a try.